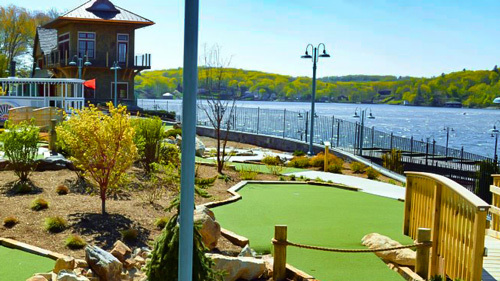 Amidst the densely packed clusters of town houses, apartments, and condos of southern Somerset County lies an oasis of preserved land, outdoor recreation areas, and historic sites. The Millstone Valley Scenic Byway is a narrow 23-mile roadway loop paralleling the western side of the Millstone River and the eastern side of the Delaware & Raritan Canal between the villages of Millstone and Kingston. National Scenic Byways are designated by the Federal Highway Administration to help to diminish the effect of urban sprawl swallowing some of the nation's threatened scenic roads. 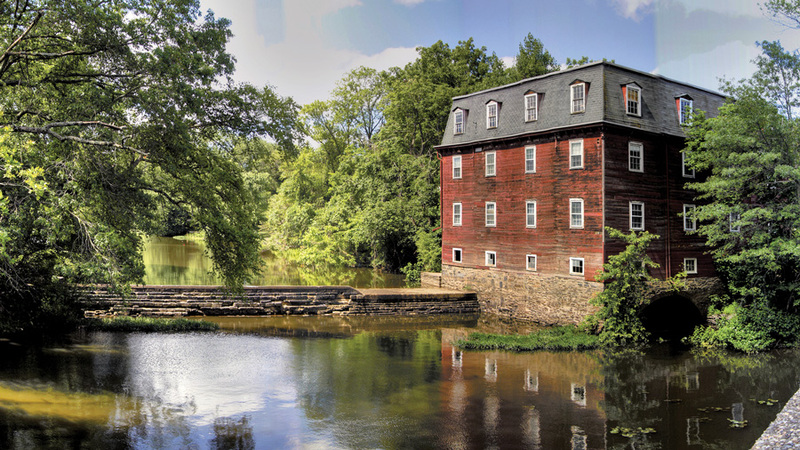 The privately owned “old red mill” along the Millstone River at Kingston was built c.1888, on the site where British troops burned an earlier mill during the Revolution. Found within the Byway are eight Historic Districts containing buildings of historic and architectural importance; a twelve-mile section of the Delaware & Raritan Canal State Park that offers preserved vintage dwellings, albeit mostly private; an intact section of the D&R Canal with its locks and towpath; vintage bridges; and roadways over which Revolutionary War troops marched nearly 240 years ago. Outdoor enthusiasts can fish, hike, bike, jog, horse-back ride, canoe or kayak and bird-watch at various locations. The main D&R Canal, which was completed in 1834, ran from Trenton to New Brunswick through villages within today's Byway, utilizing barges pulled by mules and small steam tugs to transport coal, farm produce, livestock, and various materials, opening up distant markets for local farmers, residents, and businessmen. After nearly a century of operation the canal closed in 1932 and in 1974 was designated a 70-mile-long linear state park. The southernmost end of the Byway follows Route 27, once an ancient Indian path, as it passes through the picturesque town of Kingston, a mile north of Princeton. Alongside Route 27, after crossing the Millstone River and D&R Canal, a parking area gives access to the canal, towpath, or river. 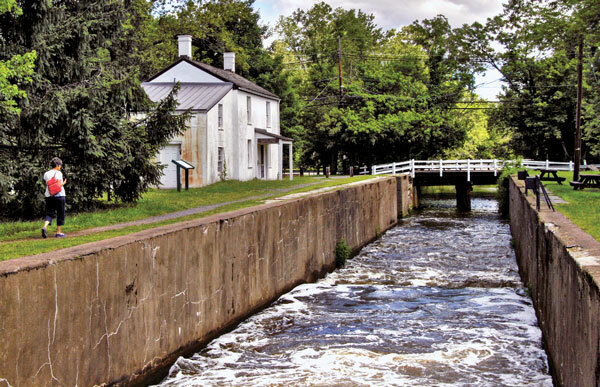 The two-mile-long Kingston Branch Loop Trail from Kingston to Rocky Hill begins here, and there are several historic structures including canal Lock #8, the lock keeper's house, and a small bridge tender's station. Bridge tenders operated machinery that turned the bridges so canal boats could pass and lock tenders controlled the locks that raised and lowered boats through the canal's various elevation changes. The canal company provided dwellings for the men who controlled the locks such as this house alongside D&R Lock #8 at Kingston. A short walk leads to a view of the c.1888 “old red mill” and its dam on the site of an earlier mill burned by the British during the Revolution. A second dam seen in the distance impounds Lake Carnegie. Nearby is a c.1798 four-arch stone bridge, the only one of its kind in central New Jersey, built where George Washington destroyed an earlier bridge hoping to hinder British troop movement. And across Route 27 is the ancient cemetery in which Washington held his “conference on horseback” after the Battle of Princeton, deciding to take his exhausted troops to recuperate at their Morristown winter encampment. 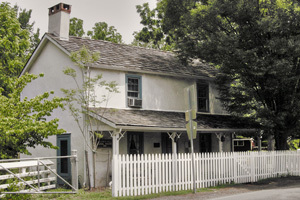 A dozen miles north of Kingston at the northern end of the Byway, Amwell Road passes through the villages of Millstone and East Millstone, both having buildings dating from the early 1700s when settlers first came to the area. Since 1738, various bridges over the Millstone River have made the two villages seem as one town. Having been named the county seat in 1738, Millstone's earlier name was “Somerset Court House”, a bestowal that prompted the village's rise as the area's commercial center serving residents on both sides of the river. A roadside marker on South River Street commemorates the location of the courthouse, which was in constant use until 1779 when Simcoe's Rangers (affiliated with the British army) raided the hamlet, released prisoners from the jail and burned the courthouse. Above: The village of Millstone may have derived its name from this hollow boulder, said to be an Indian mill stone. Below: It is possible that this blacksmith shop in Millstone has been in operation longer than any other smithy in America. 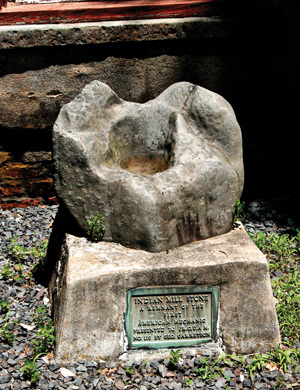 The origin of the “Millstone” moniker is uncertain, but at the Old Millstone Forge on North River Street in Millstone rests a large locally discovered boulder with a deep depression thought to be an Indian mortar or mill stone. Did its discovery give rise to the name “Millstone”? 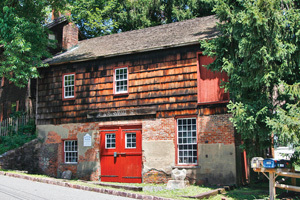 The forge, built by 1740 and possibly the longest operating blacksmith shop in America, is a living history museum open seasonally for tours. While nascent East Millstone remained agricultural at first, completion of the D&R Canal in 1834, and the Millstone & New Brunswick Railroad in 1850, spurred prosperity and growth as manufacturers came to town, taking advantage of convenient shipping to distant customers. But by the mid 1900s, the canal had closed, the railroad ceased to run, and businesses closed down leaving the town mainly residential. The canal basin, once a busy shipping port along Market Street, has been filled in, and a narrow trackless open strip of land is the only trace of the railroad. 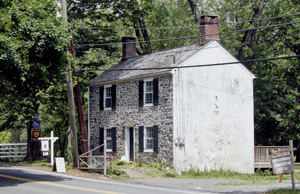 In East Millstone, structures of note along Amwell Road include the canal bridge tender's house and the mid-1700s Van Liew farmhouse which British General Cornwallis commandeered as his headquarters in 1777, later becoming the canal-era Franklin Inn which catered to canal and rail workers. Also in 1777, several thousand British troops bivouacked in nearby fields in what is now the 686-acre Colonial Park Arboretum, which offers a fragrance & sensory garden, ornamental grass collection, perennial garden, rose garden and more worth viewing. Among the chronologically diverse structures across the river in Millstone is a privately owned 20th century house designed by Frank Lloyd Wright including his characteristic built-in furnishings. A small parking area along the canal at the edge of East Millstone provides access to the D&R Canal Trail, part of which is incorporated in the East Coast Greenway, a 2,900-mile trail project in development which will eventually link major cities from Canada to Key West. River Road south from Millstone to Rocky Hill passes through the River Road Historic District, which contains many privately owned vintage dwellings. This area witnessed much Revolutionary War activity. In 1777 Patriot militia camped at Millstone following a successful skirmish against the British, and, a few months later, Lord Howe's British army bivouacked at Millstone in a failed attempt to draw Washington into an engagement. Earlier that same year George Washington's troops bivouacked in fields south of Millstone while he stayed at the nearby Van Doren house. Hessian troops allegedly cared for their sick and wounded in a barn near that house. And in a field nearby, British troops camped in 1778 while British officers stayed at the parsonage at Millstone. Eighty years later the same field was used to muster Union troops during the Civil War. In 1777 British troops routed by Washington at Princeton fled along River Road, abducting Peter Van Derveer from his home near Beden's Brook, forcing him to guide them to New Brunswick. About the same time, legend claims a Tory panicked by the approach of Washington's army hung himself in a barn near the Griggstown bridge. And over a century later Albert Einstein is said to have made weekly visits to a spring in the same area, filling containers of water to take back to his home in Princeton. Historic Rockingham, in which George Washington once stayed and is now used as a museum, has been relocated three times. Just north of Kingston, on Kingston-Rocky Hill Road, rests the c.1710 “Rockingham” mansion, where in 1783 George Washington conducted business and entertained luminaries such as Thomas Jefferson and James Madison while waiting for the Continental Congress in Princeton to formally conclude the Revolutionary War. Here he wrote his Farewell Orders discharging the Continental Army. Originally located a mile north, Rockingham has been moved three times between 1896 and 2001 as nearby quarrying operations threatened the historic building. Before being purchased for preservation, quarry managers and dozens of Italian workers dwelt in this house. Rockingham offers various programs including its popular Holiday Candlelight Tour and guided tours held Wednesdays through Sundays. More information may be found online or by calling 609-683-7132. A mile north of Rockingham, at the intersection with Washington Street, is the reconstructed foundation of the Rocky Hill bridge tender's house and a parking area providing access to the canal and the northern end of the Rocky Hill Branch Loop Trail. Nascent Rocky Hill village began about 1712 as Europeans began slowly settling along the Millstone River, which powered their early mills. But it took the coming of the D&R canal and later the railroad to spur the village's strongest growth. But as a decline in Rocky Hill's industrial base took place around the turn of the century, its growth came nearly to a halt. For that reason the village appears today much as it did a century ago. Although only scant remains exist, the area where Washington Street crosses the Millstone River into Rocky Hill was once filled with industrial works including various mills, an engine house, railroad station, lumber yard, and a sash and blind factory. Today the only obvious remnant of the once sprawling mill complex is the pottery shop of John Shedd Designs, which offers magnificent ceramics and custom jewelry. Canal Road heads northerly from the last mentioned intersection and through the five-mile-long Griggstown Historic District, tracing the eastern edge of the D&R canal and the route of the original pre-Revolution road formerly known as “Griggstown Road”. This road today, bordered by stately old trees, offers the most idyllic ambience of the Byway, offering glimpses of the canal, occasional vintage farm houses, barns and outbuildings, some predating the Revolution. As commemorated by a roadside plaque, in 1777 Washington led his army along this road on their way to Morristown, crossing the Millstone River at Griggstown ahead. In contrast to Canal Road's bucolic character today, between the 1890s and the Depression years the world's largest terra cotta tile manufacturer employed nearly 300 workers at a noisy bustling factory complex a couple of miles south of Griggstown. And in the pre-World War II years, displeased local residents watched as youthful campers from a German-American Bund camp which used local chicken houses as dormitories, marched along the road with their German flag flying. Some of Griggstown's homes date from the beginning of the 1700s or earlier. By 1735 an early gristmill along the Millstone River served as a gathering place for early farmers, and by the Revolution Griggstown had over a dozen houses, including the Red Horse and Black Horse taverns, the latter having hosted the liaison officer between Gen. Washington and the commander of the French army in 1780. Although Griggstown has had various mills, mechanics' shops, a school, church, and general store over the years, the coming of the canal in 1834 did not promote industrial growth as experienced by the Millstones and Rocky Hill. Local farmers, however, prospered because they could now ship their livestock and produce to distant markets. The Griggstown bridge tender's house serves as a visitor center and canoe or kayak livery. Clustered along the canal at the eastern end of the Griggstown causeway is the brick millhand and mule tenders' barracks which briefly doubled as a store and post office, and the stone bridge tender's house. His small shelter has also served as a weaver's shop, a wireless canal telegraph station said to be the first in the nation and, despite its tiny size, was a county library until 1970, possibly the smallest in America. Griggstown has day-use areas with picnic tables and grills, access to the Millstone River, plus the D&R canal and towpath. Watercraft may be rented from Griggstown Canoe and Kayak Rental located behind the bridge tender's house, which is also used as a Visitor Center. A walk of less than a mile south along the towpath leads to the Griggstown Lock. And nearby is the Griggstown Native Grassland Preserve with trails limited to foot traffic and some equestrian usage by permit only. Along Canal Road less than a mile north of Griggstown is the former dwelling of John Honeyman, a legendary Revolutionary War butcher and spy for Washington who gathered information while pretending to be a devout Tory. 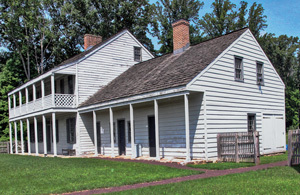 When angry Griggstown residents threatened to burn his house, a letter from Gen. Washington was read declaring that no harm should come to his family or property, adding, to protect Honeyman's cover, that he was a “notorious Tory”. Sources claim he gave Washington information that enabled the successful attack on Trenton the day after Christmas 1776. One would not expect to find locally grown farm-fresh products in an area surrounded by such dense housing. Yet, just a short distance up Bunker Hill Road from the canal the Griggstown Farm Market, an agricultural oasis offers a wide selection of their own farm-fresh poultry, produce, pies, and more. Canoeists and kayakers will enjoy the idyllic settings as they paddle along the D&R Canal. The Blackwells Mills Canal House, a former bridge tender's house, opens its doors to the public and plays host to several events. South of Blackwell's Mills, Canal Road runs through the western edge of 3000-acre Six Mile Run Reservoir Site, so named because there were once plans to create a water supply impoundment there. Forests, open fields, and miles of winding trails invite hikers, bikers, and equestrians as well as photographers and hunters. During hunting season take the standard precautions when using the area. Parking areas are located on Jacques Lane and on Canal Road. Blackwell's Mills, a small hamlet at the western edge of Six Mile Run Historic District a few miles north of Griggstown, also began with the establishment of a mid-1700s mill along the western edge of Millstone River. But, as at Griggstown, growth was slow. Even after the canal came, Blackwell's Mills contained only a few dwellings, a store, and of course the mills although the canal boosted the local farmer's prosperity. During the mid-1800s the eastern portion of the hamlet was called “Mechanics Corner” hinting at the existence of smithy and wright shops. Still extant are the canal bridge tender's house with its outhouse privy, his nicely restored station, and an adjacent garden patch which he may have tended while waiting to swing the bridge. A wide range of programs are offered here including antique and craft shows, plant sales, and more. For information click or call 732-873-2133. The river, canal, and towpath are accessible here as are picnic tables and grills with views of the Millstone River. 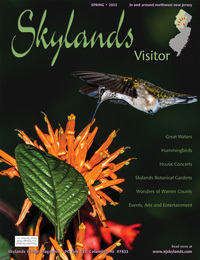 For more information check the Millstone Scenic Byway official website.